Hi there, I hope y'all are having a great summer! It's been around a month since school has been out and we have made several trips to the themed parks, space center, beaches, museums etc. There are more planned trips, but at this moment Nikolai's room is being remodeled to a big boy's room. I can't believe my boy is growing up so quickly. 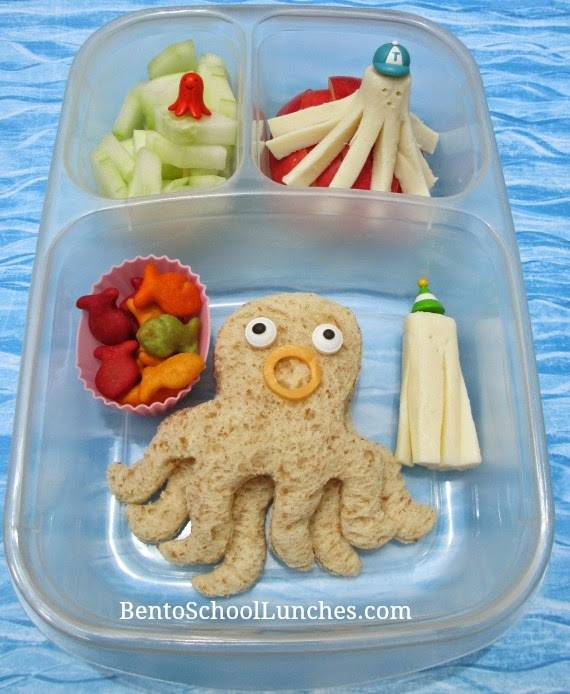 I made this octopus themed bento for our trip to the beach the other day. I used string cheese for the octopus since we were out of hotdogs for the octodogs which Nikolai initially suggested. This lunch is packed in an Easylunchboxes container. Octopus shaped sandwich with icing eyes and cheddar mouth. Octocheese, I free hand-cut a string cheese in half and the tentacles, used a toothpick to make the face impressions. Goldfish crackers in a silicone cup. Another octocheese above apple slices. Adorable! I love your octopus and his mouth! So cute! Sounds like a great summer vacation! Love this so much, really cute! Sounds so fun! Your octopus is so adorable! This lunch is just gorgeous, I LOVE the sandwich, it's brilliant!